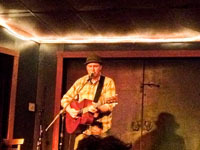 Peter Mulvey takes the craft of American singer-songwriter out of the humdrum of a “guy and three chords on a guitar” into the realm of oft-comedic-oft-sentimental storytelling mixed in with the grit of the road and the shine of fine silver in your grandmother’s dining room. He plays Tom Waits with humility and charm, and he plays perfectly ear-worm inducing folk-pop originals. 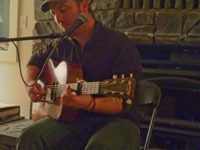 He plays show tunes, rock covers, and Michael Hedges-executed instrumentals. His music gets stuck in your head, and for me, any time I hear of new music from him, I get it without question. I also try to see him whenever I can… which brings me to recount the past three days of fantastic music. 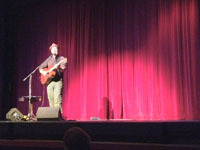 Three Peter Mulvey concerts, three unique experiences. First up, an interview with Peter Mulvey on KLCC Living Large (stream it here). He talks about his tentative new standards album (tentatively called “Pocket Diamonds“) and played a few new songs in the studio. 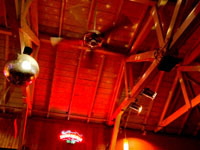 The first of three shows was at Sam Bond’s Garage in Eugene on Thursday, November 10th. 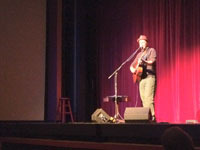 The opener was local musician Michael Conley. He played a shortish 25 minute set, but I was impressed with his songs… he fit in really well with fans of Peter Mulvey and Jeffrey Foucault. Good guitar work. Gritty songs, yet with a pop edge. 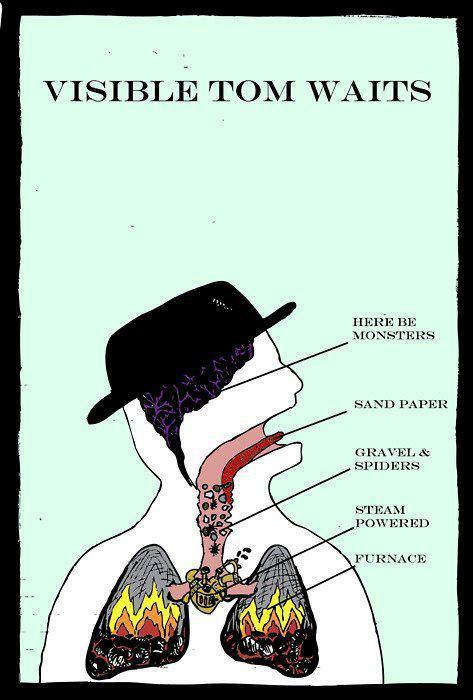 SO, how do you make a concert experience better? 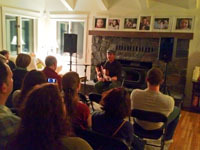 You invite the musician to your house (or a friend’s house in this instance) and have him play in a living room for 35-40 of your friends. 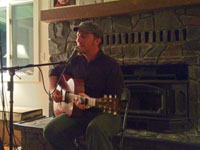 Well, that’s what we did on Friday, November 11th… we invited Peter to play at a friend’s farm in Creswell (near Eugene). He played two fantastic sets, with only a little bit of overlap from the night before. There was much fantastic music, fantastic food (a HUGE vegetarian smorgasbord thanks to host Jenny! ), vegan cupcakes (yay Divine Cupcake! ), great craft beer and homebrew beers and sodas, and great discussion! I bought tickets to the Corvallis show (Saturday, November 12th) before I even knew about the Sam Bond’s show and before I could organize the house show. Was I going to go? Um… duh! This was my first time to the Majestic Theatre in downtown Corvallis. It was a gorgeously remodeled theater, and it looks like they’re ramping up to have a lot more exciting things going on (if you’re local, friend them on Facebook or sign up for their newsletter). 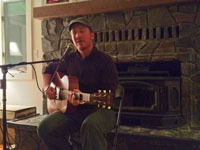 We had a wonderful dinner at Del Alma then dodged the rain to catch the opener Joe Von Appen. I had only seen a YouTube clip of him prior, and it didn’t grab my interest. Well, I’m glad I showed up for his set. He was a mix of thinker/agitator/comedian/one-man freak show. He was thought provoking, humorous, and frighteningly exciting and entrancing. He is from Portland, and I hope he makes his way down south sometime again. He was highly entertaining! A new Mulvey tune “The Cardinal” made its first appearance for me. It was a touching tune that came along with a seemingly non sequitur story about a squirrel getting into a large batch of THC butter. Another favorite song he played was a Joe Henry cover… “Richard Pryor Addresses a Tearful Nation“… I think I’ve heard Peter play this before. Prior to this, though, I was only familiar with Joe’s producer/mixer work (he does a LOT, specifically Over the Rhine’s latest album that I’m currently listening to in advance of their gig this coming week – The Long Surrender). Some gems of info… Peter was once in an all-rollerskate version of Oklahoma! Also, apparently, scientists have a difficult time showing THC toxicity in small animals. A new expression Peter uttered… “the nickel of espresso dropped.” (explaining when the caffeine kicks in). I dig it! Peter has a new guitar duets CD out now, Nine Days Wonder, with long-time collaborator David “Goody” Goodrich. It’s a fantastic record (click the image to the right for samples) – though it’s not really indicative of his live show. Based on the amount of new material he played this weekend (five songs not on a PM record yet), it looks like he has a good start on a new studio record. Here’s hoping! In the meantime, check him out on Facebook, iTunes/Amazon, YouTube, etc… and go see him live if you get a chance. He plays upwards of 120 live gigs a year all over the US (and sometimes in Europe, too). Next shows for me… Cirque du Soliel presents Michael Jackson: The Immortal (Eugene 11/15), rapper Chali 2Na (Eugene 11/16) and the Americana duo Over the Rhine (Portland 1/17).